If you like a side of exercise with your beer, then lace up your sneakers and get ready for Medford's Pint Rider. The local Pint Rider gives the phrase “pedal power” a whole new meaning. You and a group of friends can pedal your way to the best breweries in Medford. 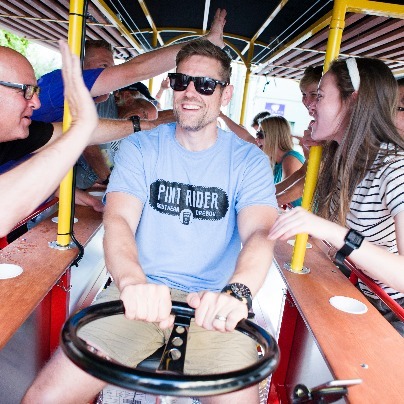 The Pint Rider holds up to 15 people and is similar to a Party Bus, but more interactive. The Pint Rider puts you smack dab in the middle of things—pedaling, laughing and enjoying the refreshing autumn weather. You can rent and ride the Pint Rider for 2.5 hours. This group-oriented amusement activity is a safe, fun, and eco-friendly way to explore Medford restaurants, breweries and the downtown core. Medford’s handcrafted microbrews and nanobrews take the flavors of the Rogue Valley and serve them up in a tall, frosty glass of beer. You and your friends can use the Pint Rider to tour the Medford Ale Trail. 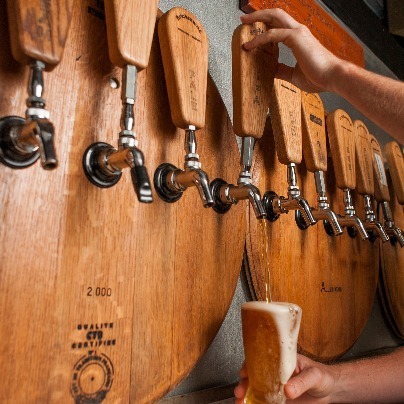 In addition to showcasing the area’s best brews, the Medford Ale Trail is your guide to local breweries, tasting rooms and where to fill your growler. Whether you’re giddy for an IPA or loving a lager, Medford’s breweries have a variety of beers on tap to satisfy every taste. Medford's breweries range in style from a comfortable, home-like ambiance at Opposition Brewing Co., to the eclectic offerings at Portal Brewing Company, which is housed in the old Central Fire Hall in Medford’s downtown historic district. With so much to drink and see, Medford is a beer-lover’s paradise. If you’re looking for something savory — or sweet — to pair with a local beer, indulge in award-winning cheese from Rogue Creamery, Harry and David Moose Munch or decadent chocolate from Lillie Belle Farms. Or if you're looking to explore more breweries across the region, the Southern Oregon Ale Trail will extend your delicious journey. The Pint Rider and Ale Trail are two of Medford’s many adventures. Whether you crave a locally crafted beer, an artisan meal or a night at the theater, Medford serves up an unforgettable experience.